This entry was posted in Dell Horoscope " The Astro-View from Scotland" (9 articles) and tagged Astrology, Dell Horoscope Magazine, Fate or Free Will?, horoscope, Johannes Kepler, Liz Greene, Northern Lights, Uranus’ discovery degree. Bookmark the permalink. Thanks Anne, I appreciate your stories, your use of words and your ideas. My nUranus at 22 deg 05 sec Gemini on the 2nd/3rd cusp helps me understand my own similar life long interest of 46 years. Thank you. That’s great feedback, Carla, thanks. One other astrologer has already left a comment on my A: Q n A Facebook page letting us know that her Moon is close to that degree. It’ll be interesting to see who else turns up! And you can add me to your list, Anne. My Moon is less than a degree from that Uranus. Certainly will, Christina! I’ve just put this post up, so it will be interesting to see how many more 25° people it attracts! Haha. Probably lots (24° Gemini Asc here!). When I compiled the TMA piece on Uranus (Aug 2017), I wrote: When discovered, Uranus was at 24° Gemini, a degree now ingrained with a Uranian quality, and some astrologers (such as Paul Wright in The Great Ages & other astrological cycles, Parlando Press, 2007) have written at length about the Uranus cycle – the squares, oppositions, and returns to its own discovery degree. This degree appears in many of the charts of authors referenced in this piece. So pleased to have you drop by and contribute, Frank ! I’ll add this to the comments on the post, so that readers not on Facebook can develop more of a perspective on this degree…I now feel inspired to go back through my TMA s and re-read your piece on Uranus. Is there a stand-alone version, or plans for one, for folk who aren’t TMA subscribers? It would be a great idea to bring your community compilations on Mercury, the Moon and Uranus together in a booklet folk could then purchase. Or maybe that’s already done and I’m not up to speed? Hi Anne, I don’t have anything in Gemini but I have Venus/Pluto at 24º degrees of Leo, Uranus at 23º of Cancer and Neptune at 23º of Libra. I love astrology and have an impression that its something i knew from a long long time ago. Thanks, Deborah. I’ll be reflecting on the harmonics of 24/5 degrees now and their linking with 24/5 Gemini!! Many thanks, Amy, for contributing to this illuminating feedback on how connections to that 24/5 degrees Gemini astrologers’ degree manifests in your life. So far, the feedback would suggest that it relates at least to life-long fascination, and in some cases to going on to become a practitioner. Fascinating stuff! North Node 24.47 Gemini, Uranus 14.02 Gemini, both in the 3rd. Some added info for you theory. I discovered Astrology in the 70’s, been part of me ever since. That’s great feedback, Paula, thanks! The North Node at the astrologers’ degree looks pretty potent. It’s not my theory, btw – it has a long pedigree. You could check out some of Frank Clifford’s references in comment above if you’d like to follow some of what’s been written on the astrologers’ degree in more depth than I could in a short column. Thanks, Lana. Are you a practising astrologer – or a keen student? Me too! 22 Gemini on the ascendant. Thanks for this great article. 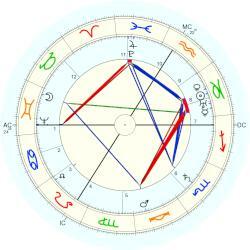 I am a Gemini with the Sun in 24 degrees, conjunct Uranus at 0 Cancer, and the Moon in Aquarius (10th House). Astrology was my first profession. I soon discovered that it was not a stable financial career, so I sidelined it and have had many other money making careers. Astrology is a hard habit to break—even as I work to stay in the moment without deductive belief systems. I felt in love with astrology about ten years ago, became an astrologuer studing by myself. I also love the concept of Aquarius/Uranus (Sun, Mars and Moon have aspects to Uranus, south node in Aquarius) and even I have a crazy cat named Uranus. And I have my Sun at 24º17′ Gemini. Beautiful! Great stuff, Teresa. That astrologers’ degree Sun of yours is even infectious…sounds like your cat’s caught it! My midheaven is at 28′ Gemini; my friends and family always come to me and ask what is going on with the stars! Well, Mary, now you can give them a new nugget of astro-information! That’s one of the most significant midpoints, Rachel. So I think it certainly does count! It’s an interesting theory. I only have Jupiter in wide conjunction with that degree at 28 Gem and the moon square it from 28 Pisces. I suppose you could include an inconjunct from Venus In Cap. Does that count? I was first interested in astrology from the age of six, but possibly only because my family had one of those seventies style clocks on our wall that depicted the zodiac symbols in place of the hours. However, I think it would only have been a matter of time, even without the clock, because I was a very curious and mystical child, the kind that likes to draw diagrams of their theory about the nature of time and who or what created the universe and the creator (Moon conjunct Scheat in Pisces in 9th – loves to think and theorise). However on the broader subject of Uranus itself as the astrologer’s calling card, if you will, I have it conjunct my MC by parallel from Virgo, which is also said to be the astrologer’s sign, by some, because of its strong analyical urge. Re orbs – I’m pretty relaxed about that. I think a 3 degree orb for links to a zodiacal point is fine, and I go with Liz Greene in viewing 10 degree orbs between planets as having relevance too. Thank you for such an interesting article. My ascendant is 24.25 Capricorn, Moon is 25.55 Taurus, and when I discovered astrology, my IC had progressed to 24 Gemini. My husband’s ascendant is 24.25 Gemini! He’s the one who gave me “The Birthday Book” and it was that book that got me hooked. I have Venus at 25° 24′ Gemini in the 12th house along with Sun, Jupiter, Saturn and Uranus in that house too. I am one of the ‘ old hands’ from the early days of the SAA in Edinburgh. I have written about, given talks about and taught astrology. I think I could say I love it. Reshma, what very interesting feedback! Thank you for contributing – there has been such a fascinating series of 24/5 Gemini stories in response to this post. Wonderful stuff! Very interesting to come across this. This degree figures centrally in my natal horoscope. And it’s remarkable that I came across this as the transiting N.node is currently in the middle of my Ac. and Uranus, opposite my Jupiter/Saturn. I would venture that the influence of this point exceeds Astrology alone, into the study of all things Mystical and , Occult. And that in the chart of Kepler too, with Neptune rising there. I have another point at 28 Ceres in my Virgo area …. and Gemini is where my poor in detriment retro Mars hangs out, in my 4th H … which is probably why I never *leave* my house, hehe. So a lot to chew over! Also, I have recently read and finished Richard Tarnas’ Cosmos and Psyche, which is equally chew-worthy. Thanks for this piece of Indian mythology, AM. Glad I’ve provided food for chewing…and yes, I agree with your assessment of Cosmos and Psyche. It sets a pretty unassailable standard in chew-ability, I’d say! How intriguing! I had not heard of the discovery degree before. I've been pursuing my fascination with and passion for astrology in one form or another since 1988 since the day that I saw Donna Cunningham's book Being a Lunar Type in a Solar World on a friend's bookshelf and the title grabbed me. I knew nothing about astrology before that beyond that other than that I was born under the sign of Cancer, which was symbolized by a crab and an odd little sideways 69. Thanks for this piece. My north node is 23 degrees Gemini opposite Pallas conj. South node. Been self studying and reading astrology books and online writers for 20 years or so. Sun is 24 degrees. Heavy Pisces and Virgo too, including healing. Been focusing on reiki but maybe it’s ok to keep up with astrology too? I would think so, with those links, Carrie! I apologize for double post. I missed this, for your research on 24/5 … I’ve long thought 24 degrees was unusually significant in many charts over the years, but couldn’t nail down why or how consistently. Also, Chiron and Uranus are each 14 degrees here in opposition (14/5). 10th and 4th house axis in Pisces and Virgo. I loved this article. Can fate be gently encouraged by guardian angels? Thanks, Linden. Yes, I would agree with that ‘not so gentle push’ in terms of my own and others’ experiences….